So far I have looked at two theories of physical law. Lewis says that physical laws are descriptive statements made humans, whereas Armstrong says that law are relations between Universals, and so exist out there in the real world. I want to get a similar contrast within legal law. So far we have Kelsen’s theory, where laws are normative statements made by humans. We can contrast this with a theory of natural law. According to natural law, there are laws that exist out there, that are true whether we know them or not. Natural law has existed as an idea for millennia. I am focussing on the work Natural Law and Natural Rights, a seminal restatement of the doctrine by John Finnis. In this post I will just summarise Finnis’s theory. I also have some criticisms, and an attempt to combine this theory with Kelsen’s theory. John Finnis is an Australian legal scholar who grew up in Adelaide before getting a Rhodes scholarship to Oxford. He is currently professor of law at Oxford. Finnis published Natural Law and Natural Rights in 1980, and the book is considered a seminal restatement of the natural law doctrine. Finnis is a practising catholic, and a fair proportion of his work (in NLNR and subsequent articles) deals with the relationship between natural law and Christian/Catholic values. Practical Reasonableness, i.e. the ability to reason correctly about what is best for yourself, and to act on those decisions. The basic goods serve as an explanation of why we do things. Any worthwhile activity is worth doing because it participates in one or more basic goods. Other positive qualities, like freedom or humility, are merely methods by which we can achieve one or more of the basic goods. Other motivations for action, such as the pursuit of pleasure or material gain, are misguided and motivated by human inclination rather than practical reason. The statement ‘these are the seven basic goods’ is just as true as the statement ‘there are infinitely many primes.’ The basic goods exist independent of human thought, and so we can put them in ‘reality’ in the same sense that maths lives in reality. The basic goods, of course, do not have physical form. Where do these goods come from? Principles like these cannot be derived from the principles of logic, and can be meaningfully denied. But if you deny a principle like this, you will find it impossible to pursue knowledge and you won’t be able to get anywhere at all. Moreover, you can just see that these principles are true by looking around. The basic goods are the same. They cannot be derived from God’s law, or logic, or the inclinations of a human brain. But if you deny them, you cannot get anywhere in the realm of practical reason, and you cannot make decisions about what is best for your life. And, just with theoretical principles, it’s obvious that these goods are basic. 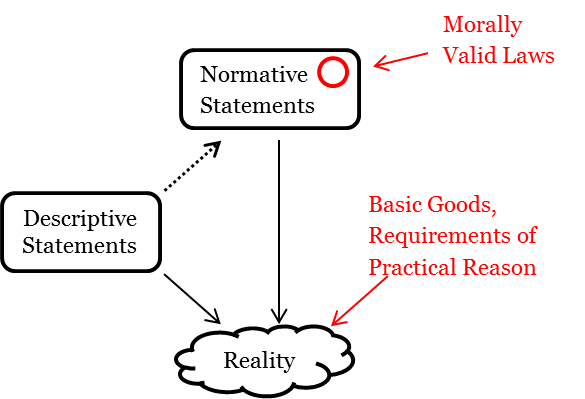 In this way, the seven basic goods are self-evident. It is important to make a distinction here. 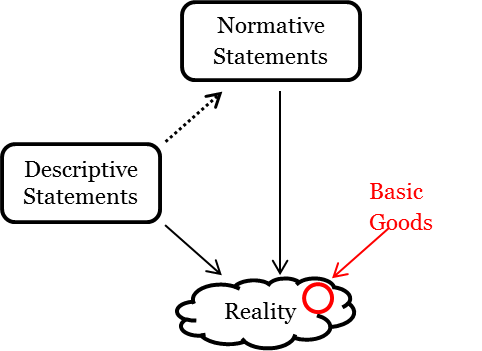 It is not true that everyone is automatically aware of all the principles of theoretical rationality – a toddler may not understand a modus ponens argument. But such principles are known to every educated, mature person. In the same way, Finnis acknowledges that there are people who do not respect the basic goods; it’s just that those people are wrong. You naturally have to prioritise certain goods over others (e.g. an academic would prioritise knowledge higher than a tradie), but you should always do so with good reason. You should never arbitrarily discount one of the basic goods. Basic goods apply equally to all people. You can be self-interested to the extent that you are in the best position to look after yourself, but you should always take into account the good of others. You should make sure that you do not become obsessed with a particular project, and keep the perspective that the project is a participation of a basic good. You should calculate and plan your actions so that they are the most efficient (in a utilitarian sense) and do the most good. You should never commit an act that directly harms a basic good, even if it will indirectly benefit a different basic good. For example, you should not kill even if it will indirectly save more lives later. You should foster the common good of the community. You should act according to your conscience and practical reason, not the authority of someone else. The seven goods and the nine requirements apply equally to everyone. To make specific decisions in your life, you think reasonably, in accordance with the nine requirements, and decide how you will participate in the basic goods. There is plenty of scope for discretion in this scheme. If you are deciding what to do with your day, you could choose to listen to music, or to go hiking, or to go to a party, or to volunteer for disaster relief. These are all, in principle, valid choices. Some choices are wrong, e.g. murdering someone, or spending all day in an empty room doing nothing, but there are many equally correct choices. The seven goods are all equally fundamental, and do not exist in a hierarchy. Therefore, although some acts are wrong (because they do not participate in a basic good), there is no single correct act. This is an important distinction between theoretical and practical reason: in theoretical reason, if two statements contradict then at least one of them must be false. In practical reason, there can be two contradictory acts that are both morally correct choices. It is up to a human’s free will to choose which act they will adopt. In this way, the seven goods and the nine requirements specify the overarching structure and goals, but do not determine the minutiae of day-to-day life, or even big decisions like the choice of career. The common good is the situation where each member of the community can effectively pursue the basic goods for themselves. Like one of the basic goods, the common good is never achieved, it is only participated in. Such community-wide actions require coordination, and coordination requires authority (not necessarily coercive authority). Such coordinating authorities include churches, team captains, university heads of department, and governments. One of the basic goods is practical reasonableness. It is necessary that every member of a society be able to make decisions for themselves. Authority figures therefore need to compromise between coordinating society effectively, and granting people the ability to pursue their own ends in the manner they choose. One of the strongest and most effective sources of authority is the law, and therefore, Finnis concludes, law is a morally necessary component of society. How is the specific content of law morally determined? Some laws directly serve basic goods (e.g. the law against murder). Most laws however, are not so direct – instead they create a stable society in which people have the freedom and ability to pursue the basic goods. Before, I said that each person is free to choose the specific details of how they achieve the basic goods – in the same way, the authors of the law are free to choose the specifics of the legal system. As long as the legal system is in service to the basic goods and in accordance with practical reason, it is a morally ‘good’ legal system. Of course, some legal systems will be better than others. A society deciding between legal systems is equivalent to an individual deciding between conflicting moral decisions. What features should a legal system have? I ought to obey the law. Therefore you have both a legal obligation and a moral obligation to respect and obey the law. The legal obligation is invariant in force – the law just has offences and sanctions; no offence or sanction is legally worse than any other. The moral obligation has different weight depending on the specific offense, because some offences damage the legal system more than others. If a legal obligation is in line with a moral obligation (e.g. ‘Do not murder’) then you also have the non-legal obligation to not perform that act for moral reasons. In this way, the law is not just a coercive order. Certainly, in an imperfect society, the law needs to be coercive in order to regulate people who behave badly. These bad people follow the law in order to avoid sanctions. But many people follow the law because they believe that following the law is morally correct. In a perfect society, there would be law without sanctions that functioned only to coordinate people. What about when the law conflicts with morals? A classic interpretation of natural law is the doctrine of lex injusta non est lex: that morally wrong laws are not laws at all. Finnis first asserts that this is not the primary concern of a theory of natural law – the primary concern is discerning a system of common good, and determing whether/how a legal system can best achieve that. The issue of immoral laws is nonetheless worth discussing, and Finnis does indeed discuss it. If a law is immoral/unjust, we can reject premise number 3, and so there is no moral obligation to obey the law. We still have the legal obligation that we should obey the law if we want to avoid the sanction. In this sense the law is still legally valid, but it is not morally valid. There is another consideration that can sometimes provide a moral obligation to obey immoral laws. Imagine that an act X is morally wrong, but is required by law. Since the law has moral force, it is morally important to ensure that the law is stable. Therefore citizens have a moral obligation to perform X for the sake of not undermining the legal system, and legal officials have a moral obligation enforce X for the same reason. This moral obligation will not necessarily trump the moral obligation that X not be performed, but it is possible that it will trump that obligation. In this way, it can sometimes be morally correct to obey the law, even if the law itself is not morally valid.